This past weekend, I was down at Chavis Park for the carousel reopening. The end of this renovation project also starts the process of creating a master plan for the park. While Nash and Moore Square offer green space, Chavis really is the closest park that downtown Raleigh has. Make a visit there this Spring if you haven’t been in awhile or ever. I recommend viewing this picture Large. The skyline is right there! 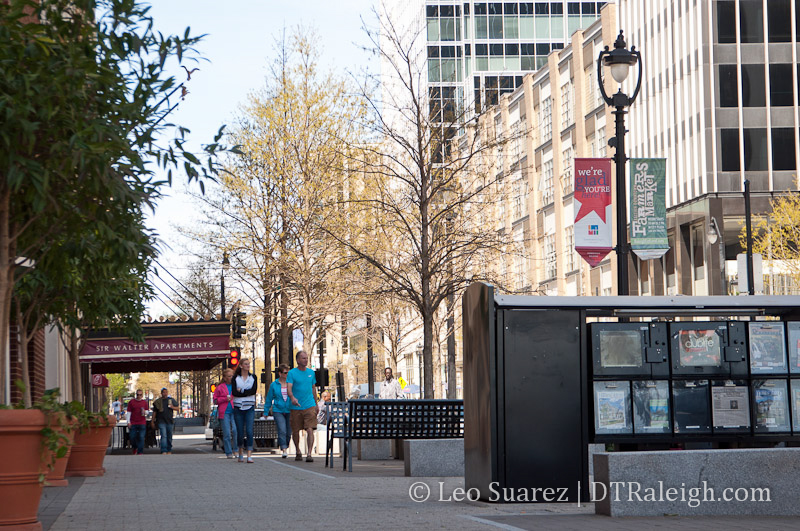 Long time readers may remember when I wrote up a walking tour on downtown Raleigh. I took that down last year because lack of maintenance and neglect basically made it fall apart. Well, I’ve freshened up the tour and am now ready to relaunch it. The tour is simple and has ten stops up and down Fayetteville Street and between Moore and Nash Square. Visitors and new residents to Raleigh may enjoy the tour to “get their feet wet” with downtown as well as see some other spots for later visits. The tour’s website is mobile ready so if you have a smartphone, there’s no need to print it out and no need to download an app. Just load the page and start walking. Even with the random warmer days this winter, the cold ones we are getting have kept me indoors. 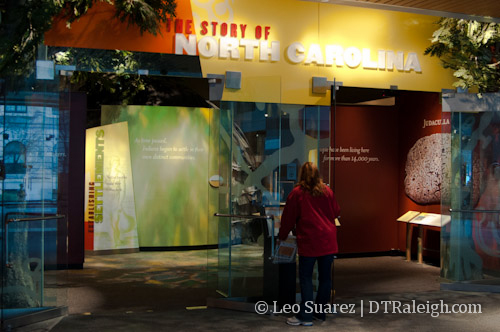 The recent cold rains ran me into the North Carolina Museum of History to check out the newest exhibit, “The Story of North Carolina.” I read about its opening back in November and have finally made it over to see it. 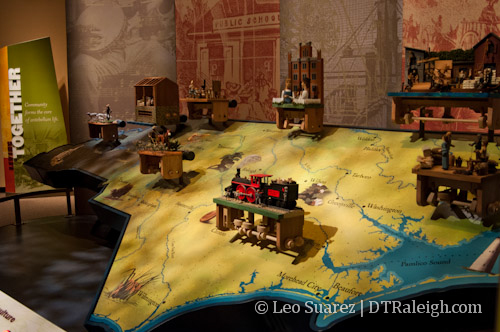 The new exhibit challenges history buffs and can entertain everyone else. 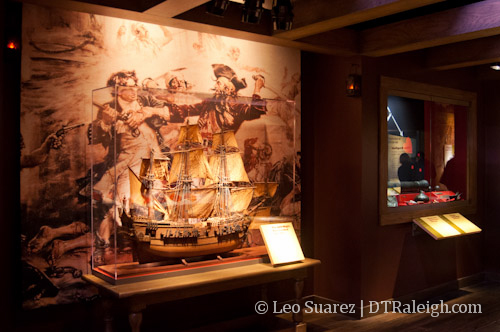 More than 14,000 years of the state’s history unfold through fascinating artifacts, multimedia presentations, dioramas, and hands-on interactive components. Additionally, two full-size historic houses and several re-created environments immerse museum visitors in places where North Carolinians have lived and worked. Yet the heart of The Story of North Carolina focuses on the people — both well-known and everyday citizens — who shaped the Tar Heel State. The two houses, one being the state’s fourth oldest, offer a glimpse into the past as they are furnished in a way to represent how they could have looked at a certain period in time. The models are detailed, the visuals are impressive, and there is enough audio and visual information to keep anyone interested. I liked hunting for random facts such as the fact that the nation’s first gold cold was minted in North Carolina in the 1830s. Back then, the state had $1, $2.50 and $5 gold coins as well. For the readers here in Raleigh, there is plenty of events that took place here in the capital. I recommend a visit sometime this winter if you’re ever stuck without plans on a dreary day. 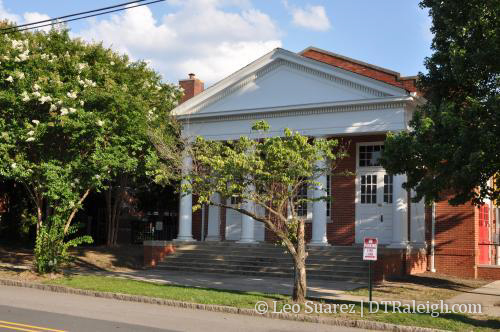 5 East Edenton St., Raleigh, N.C.
Open Monday-Saturday, 9 a.m. to 5 p.m. There are also a few more photos on Facebook. Downtown segway tours, brought to us all from the good people at Triangle Glides, are moving into a new space. 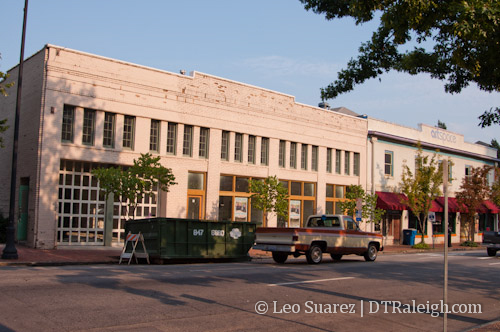 The segway and stand up paddleboard shop is moving to Blount Street in the beautiful building near Artspace. Keep an eye out for an opening within the next few weeks. 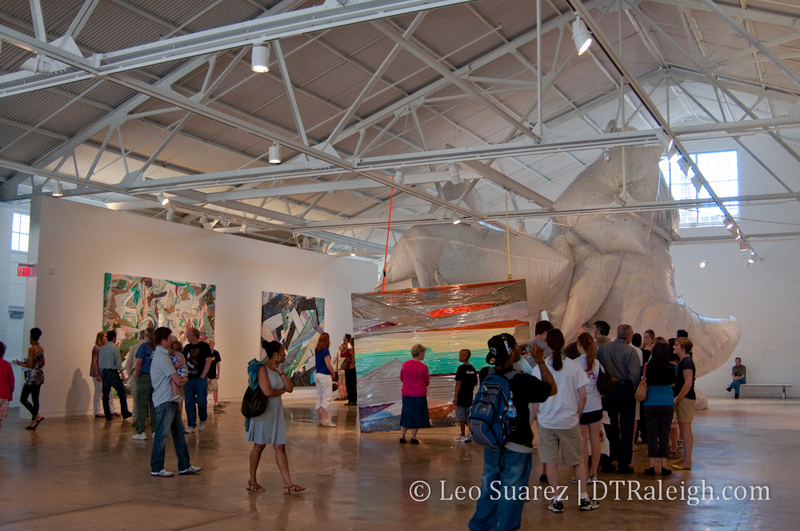 CAM: A Work of Art, Housing Works of Art via Goodnight, Raleigh! The cost to visit is $5 and the hours are listed below. Just like last year, I’ve updated the same calendar to reflect this year’s shows at the Burning Coal Theater. I went to two shows last season and I loved them. I will be attending more this year for sure. Here are the links for your date keeping, calendar of choice. 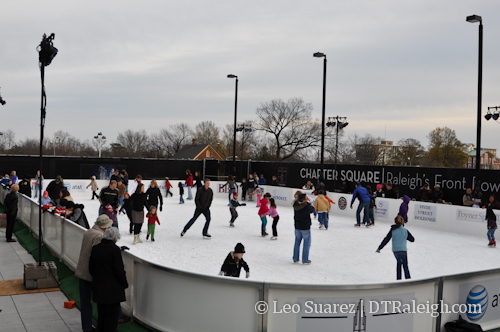 This past Friday was the start of the Raleigh Winterfest that is taking place at downtown’s City Plaza. 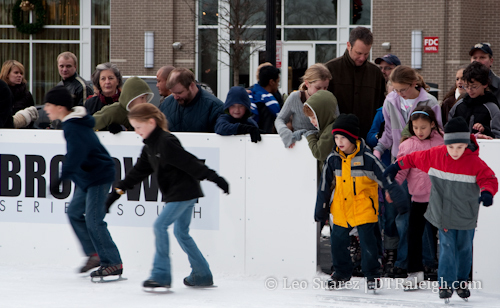 The main attraction is the ice skating rink that is now set up and ready for you to skate on. I recently walked down there this weekend and have the real answers to everyone’s questions. Is that real ice or the fake stuff like in North Hills? The ice is real but don’t expect the Carolina Hurricanes to practice on it. The ice is a little choppy and could really use some zamboni love. 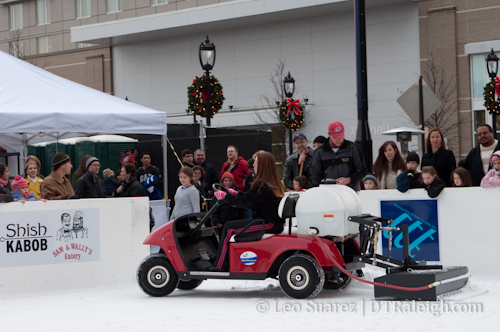 So if there is no Zamboni then how does the ice get smoothed over? A golf cart with a snow scraper collects all the ice shavings and its shoveled off the ice. It then goes over it once more with some warm water and attempts to smooth it out. The results are average at best. I see. So how much room is there to skate? Can I practice my triple axels? The rink is a decent size to skate around but not as big as the indoor rinks around Raleigh. Look at the pictures and guess for yourself. Through the eyes of a child, the rink size probably doesn’t matter. So while I’m out there watching kids fall on their butts, what is the best way to stay warm? There are a couple gas heaters placed around the common area in front. Plus coffee from Starbucks or Krispy Kreme can be had from right across the street. 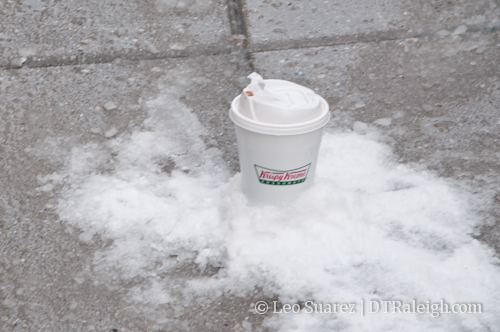 Careful though, I heard one woman claim that the Krispy Kreme coffee is too hot. Refer to picture below for her easy solution. What is the bathroom situation around the rink? There are a couple portable toilets set up nearby for anyone to use. When is the skating rink open? The hours vary depending on the day. Just go to this calendar (.pdf) and check the times. I can skate at night? Yes. Lights are set up around the rink for night time skating. There are some “Date Night” specials. Go here for the list of the nights and how to participate. Dude, you didn’t answer my questions? Well post it in the comments or go here for more FAQ’s.